Copied from and extensively modified in a Story Games forum post. Resolve, symbolized by Rock, which measures your ability to “grin and bear it” or otherwise bull through a situation. Manipulation, symbolized by Scissors, which measures you ability to change a situation into something more amenable to you. Flexibility, symbolized by Paper, which measures your ability to find alternate ways to approach and deal with a situation. Skill rating determines the maximum number of Success dice you may keep when you roll (see below). Divide nine Skill points between your three MOs. Flub rating determines the maximum number of Failure dice you must pass to another player when you roll (see below). Divide nine Flub points between your three MOs. Every character has Aspirations which are accomplished in Stages, via scenes. A given Stage might take several scenes to accomplish, however, based on its complexity or difficulty. A character’s agenda in a scene is called a goal. A player may redefine a Stage any time between scenes, with one exception: a failed scene outcome can not become a new or an alternate Stage for the failing character. It is possible for accomplished Stages to become moot, and an Aspiration to be completely re-planned or abandoned in favor of a new Aspiration. When an Aspiration is accomplished, the player may revalue all of his or her MOs’ Skill and Flub ratings, up to their original total values for Skill and Flub. Every two Aspirations that a character accomplishes increases the character’s Skill MO value total by 1 (to 10, then 11, etc). Every Aspiration that must be completely abandoned increases the character’s Flub MO value total by 1 (to 10, then 11, etc). When it’s your turn to frame a scene, choose an MO that you will be using to achieve your goal in the scene and roll five Roshambo dice. Each die result that your MO beats in Roshambo is a Success die. Each die result that beats your MO in Roshambo is a Failure die. 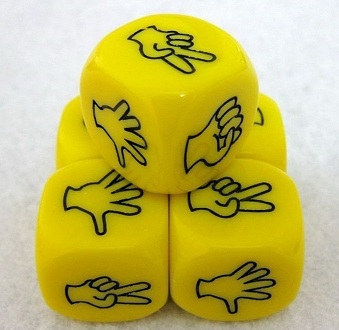 Each die result that matches (ties) your MO is a Neutral die. You may keep as many Success dice as are equal to your MO’s Skill rating. You must pass all Failure dice, up to your MO’s Flub rating; discard the rest. Distribute the remaining Success and Neutral dice evenly—you choose who gets any extras, if they are not evenly divisible. Discard the die to introduce one’s own character into the scene, state one’s own goal (which may not be identical to nor a simple negation of your goal), and roll the appropriate MO… with one restriction: Each MO may be invoked—by any character—only once per scene. So if you started with Resolve, the next player may only introduce him- or herself and state goals using Manipulation or Flexibility (and the following player introducing a character into the scene may only invoke the remaining MO). As such, a passed die is not usable for self-introduction after the third character introduction into a scene. Finally, do the above die-distributing Steps IV.A-D for this new character in the scene. Use a Failure or Neutral die to narrate a Complication against you—something which opposes your goal—while taking into account the MO of the die result (Resolve, Manipulation, or Flexibility) not the original player’s rolled MO. Use a Success or Neutral die to narrate a way past (bypass) an existing Complication, taking into account the MO of the die result (Resolve, Manipulation, or Flexibility) not the original player’s rolled MO. You narrate one of the Success die results still in your possession, taking into account the MO that you used to make your roll (not the Success die result). This is the Opening Volley, which should establish your stakes and line of “attack.” If you have no Success dice, then you are relying upon someone to narrate a Success for you (Step V.B below). Starting with the player to your left (i.e. clockwise), each player may use a passed die as explained above in Steps IV.E.1-3. Continue clockwise, introducing players, narrating a(dditional) Complication(s), or narrating a Complication resolution. If your Successes (and others’ passed dice used as Successes) run out while there is at least one Complication still to be resolved, then you have been Thwarted: narrate how the unresolved Complication(s) brings you low and your plans to ruin. If you resolve all Complications (i.e. others are out of passed dice or choose not to use them for Complications) then you succeed in your aims and may make a last narration of that result (even if you are actually out of Successes, having used the last one up to bypass the last Complication). Any additional Successes may be used to narrate follow-on bonuses or accomplishments or boons, as related to your goal in the scene. This could result in a whole Stage being completed during one wildly successful scene. Whenever your character is in a scene, you may Burn one point of a Skill MO (reduce that MO’s Skill rating by one) to narrate a Success for your agenda, taking into account the MO Burned. This reduction in MO does not affect the number of Successes that you may keep, because that distribution (Steps IV.A-D) happens prior to any Complication and, thus, prior to any reason to Burn. That’s a VERY cool idea for an aimed shot, and it might even work with melee and my ideas about ebb and flow, too. A melee attack skill lets you pick the quadrant you’re aiming for and determines the “area” of it. Different skills and/or weapons allow for larger or differently shaped areas. THEN, you can delay to narrow down that area further (aiming/calling a shot). Of course, if you delay enough that the defender’s “initiative” comes up, he might attack ahead of you. The KEY is that, once you’ve rolled to hit a quadrant, your weapon is in that “area” until some later count of initiative. This positioning, in turn, adjusts your chance of parrying against attacks against you in that quadrant. SO if your opponent then gets to his initiative count and attacks in that quadrant, you’ll have a bonus to parry. Conversely, if he attacks elsewhere, you have a penalty as you try to haul your weapon into that new quadrant… should you choose to do so! REPEAT. Now HIS weapon is in some quadrant for some time period, and that impacts HIS defensive capabilities. Sprinkle liberally with hindering effects from limb hits, bleeding out from wounds that aren’t instantly lethal, and attacks to subdue; and I think you’d have a nice system with high verisimilitude but minimal handling. 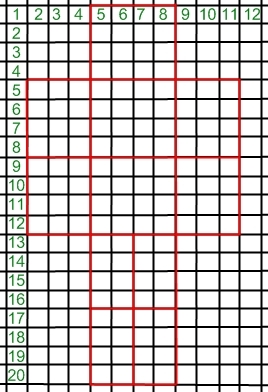 Basically, every combatant would have a chart (like that cool grid above) and maybe some tokens or a dry erase marker (laminate the grids) to mark their weapon’s current quadrant and which of their quadrants was last attacked (i.e. their opponent’s weapon position). Hmmm…. Wonder if you even need a randomizer, then, or if it could all be done with resource allocation (like action point systems). Ooo! And in such a system, delaying or aiming is how one gets more resources! Spending them dictates how accurate the hit was: you only miss because your opponent expends more resources defending (to “push” your hit off his body grid) than you spent attacking (to “pull” your hit to the best spot in the quadrant that you want to hit). Most often, combat begins when a character makes its initial attack against another character. At that moment, all combatants’ Action Point Pools are refreshed, presuming that no long-term effects of damage have temporarily reduced them. Determined by adding together the APs granted by each combat skill–some grant more than others, while some grant none but instead have other combat effects (disarming, tripping). Ebb & Flow combat is not turn-based. Instead, every character has an Viscosity statistic, which is how many “ticks” of time pass after each attack attempt before the next attempt (or aiming) may occur. A tick is not equal to a second (more like a tenth of a second), and it is only intended to be a loose metric of time passing in-game. Heavier weapons, generally, increase a character’s Viscosity but also increase or meaningfully change the “attack profile” (below). The attacker simply states the number of APs that he or she is investing, what type of attack (i.e. what “attack profile” per below) and, therefore, which squares he or she is targeting with those points. Those three pieces of information determine the direction and ferocity of the attack. Basically, most weapon types have an AP cost to add additional target squares to an attack. This changes the “profile” of the attack, when an attacker opts to take advantage of it. Some weapon types (usually huge ones) even grant some initial, extra target squares for free, usually with a much higher increase to Viscosity than lighter weapons. Linear – The attack profile weapon must “extend” additional target squares along a single line of contiguous squares. Square – The attack profile must designate additional target squares to make the overall profile as square as possible, which makes using weapon parry much more costly in terms of APs (i.e. each “row” of target squares must be pushed off a hit location; they do not push off en masse). Scatter – The attack profile may designate additional target squares anywhere on the hit location grid; e.g. a shotgun blast or multi-headed flail, which makes both parry and dodge more costly in terms of APs (i.e. the defender will have to pay big to “connect the dots” with a swirling, sweeping parry, to gather them all up and shove them off locations; OR he or she will pay heavily to individually move each one off all locations [i]in the same direction[/i] (i.e. dodging a huge distance in the opposite direction). Dodging – For each point invested in defense, the defender may move one of the target squares ONE square in a direction; if enough points are invested to move all target squares off of all red boxes, the attack will be a miss. Note, however, that ALL target squares must be moved in the same direction, to the same ending square (this is very important later)! Note that dodging implies movement of the defender’s stance (distance per square TBD) and, as such, might very well result in other effects based on terrain (system TBD). Parrying – For each point invested in defense, the defender may move one of the target squares TWO squares in a direction, so long as his or her weapon target is also moved to a square adjacent to that ending square. Alternately, the defender may use APs to move his or her weapon target to a square adjacent to a target square and then move it [i]AND all other target squares in the line of movement[/i] ONE square per AP, and his or her weapon target remains in the square just “behind” that line of movement. His own weapon target, in turn, must also end off a red box: no parry may leave your weapon target on one of your opponent’s hit locations. Put differently: when parrying, your OWN weapon target can hit you, if not also moved off any red box!). Note that an unarmed defender may not parry a weapon attack, and a weapon parry of an unarmed attack is automatically a hand hit. Note that drawing a weapon costs a number of APs shown in the weapon description, and its target begins in the square designated by the description; and if it says “A/I” and a number, use the combatant’s handedness to decide whether it’s in the A (right) or I (left) column at the designated row. Note also that this system utterly supports dual wielding: an attacker may choose which weapon target to move to attempt a hit, and a defender may choose which of his or her targets will be moved in a parry. Finally, a shield is, for all intents and purposes, a special kind of weapon that has a square-shaped target when parrying (2×2, 4×4, or even 6×6 depending upon size–thus, they can move “square” profiles en masse), a typically higher Viscosity increase to wield than a weapon, and a very high additional target square cost (i.e. one can only poke someone with its center spike or slash at the victim with its edge). Follow-up attacks work just like the defense system–in fact, Ebb & Flow is little more than investing effort to be the one who finally has the AP surplus and weapon target positioning to make a decisive blow. A defender invests APs to move the target square(s) with a dodge or parry, per above. Note that a defender might have to suffer effects of a lesser hit–for example, pushing a hit from the upper torso to an upper arm–if he or she does not have enough APs or doesn’t want to use them all up in defense. I think that’s sufficient to illustrate, maybe even to test.